Dukkah is one of those seasonings that warms you from the inside out without actually being spicy. Ideal for the weak of stomach, if you will. This blend of spices, herbs, nuts, and seeds comes to us from Egypt but finding it already blended to buy can be tricky. Dukkah doesn't contain many wild ingredients, so fear not the process of making your own aromatic blend.This past summer at a plant-based restaurant in Santa Barbara I was reminded of how versatile dukkah is. This place was topping and crusting everything with it, and now I do too. So while you can throw it on just about any vegetable or animal protein, another way to use it is on a gluten-free flatbread or cracker recipe. It works well to top off a bowl of hummus, too. Preheat oven to 400°F and prepare a baking sheet. Wash and pat carrots dry. If larger than 1" round, slice in half lengthwise. Place dry carrots on baking sheet, coat with ghee (I do this with my hands). Roast 20 minutes, use tongs to rotate, roast an additional 20 minutes. While carrots are roasting, make dukkah blend. If hazelnuts and sesame seeds need to be toasted, add to a shallow pan and toast in the oven with the carrots for 10 minutes. Keep an eye on them for doneness around the 7 minute mark. Use a mortar & pestle to crush the blend or grind in a food processor or blender. Sumac isn't the most common kitchen cabinet staple, but I highly recommend adding it. It has this indescribable sour/acidic taste that contrasts to the warmth of the other ingredients. 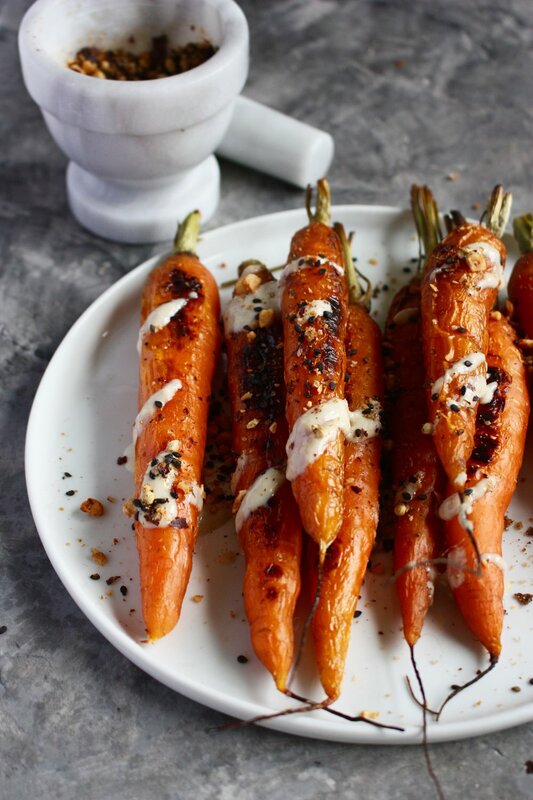 Remove the roasted carrots from the oven, drizzle with tahini and sprinkle with 1 - 2 tablespoons of dukkah. Enjoy as a warm side dish or utilize it as part of your meal prep to eat throughout the week.